What language will be used in <batch list filter string>? Captiva Expressions (), or c#, or VB.net? OR something else? If it is Captiva Expression language, which IA values will be available there? _Batch, _Node, Step, Tree, Custom, Dynamic, UimData…? Syntax of the <batch list filter string> can't be verified. Also, it might be OK for certain batches, and fail for others (depending on process that batch originates from). Command line option -batchListFilter:<batch list filter string> needs to be configured in shortcuts to Captiva Desktop module, which means it is available to end-users (they can change or manipulate it). Customized shortcuts need to be deployed to users’ desktops (more or less manually), which is time consuming and error prone. We might need multiple shortcuts for multiple -batchListFilter:<batch list filter string> combinations. I was thinking of an alternative solution, and this is what I came up with (of course, I am not sure if this is technically feasible). Captiva Capture module could call this method in order to filter out certain batch from the batch list. 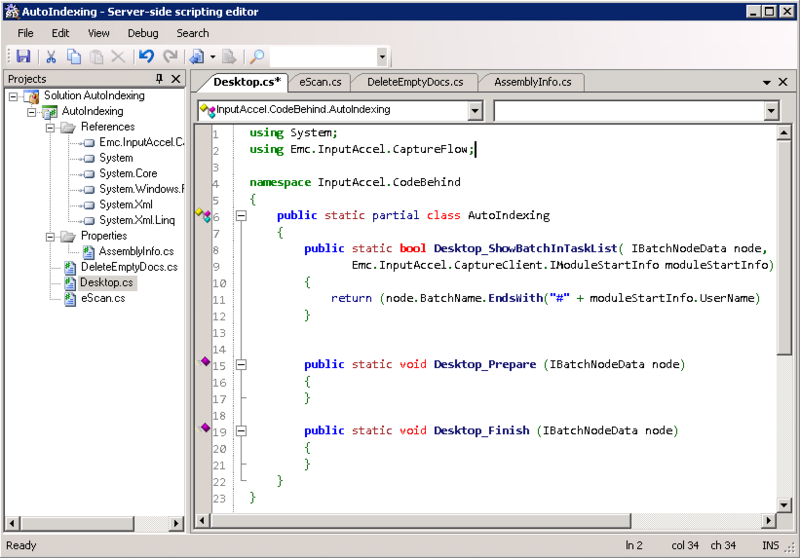 It fits into “Capture Flow Scripting” paradigm introduced with Captiva 7. <Desktop_Module_Instance_Name>_ShowBatchInTaskList is defined per step, which allows it to contain logic for the current step only. This is actually improvement over FilterBatchList architecture from IA6.5, which needed to contain logic for all processes and all steps inside single event handler. I know that input parameter Emc.InputAccel.CaptureClient.IModuleStartInfo moduleStartInfo might be a bit “too much” (i.e. it allows us to access many aspects of module), but maybe you could add something like Emc.InputAccel.QuickModule.ClientScriptingInterface.IApplication app (I know that this is from different assembly, but just as an idea…). One way of another, event handler < Desktop_Module_Instance_Name>_ShowBatchInTaskList must provide information about the current application, user, departments,… so that we can have enough data to decide whether to display the batch in list or not. When we launch Captiva Desktop module with command line option –department:dpt_1, module is started and it initially shows batches that have Desktop steps with department “dpt_1”. HOWEVER, user is able to switch to any other department, or to “unassigned”. When we launch IndexPlus module with command line option –department:dpt_1, user is not able to switch to other departments, but he can only work with “dpt_1” department. In order to be able to switch departments, IndexPlus must be started with option –department:*. Is this a bug or intentional behavior? If it’s intentional, I can see no point in setting command line option –department: for Captiva Desktop module other than selecting initial department. 1. Did you log this as an enhancement for Desktop? 2. Do you have any details about the progress? 3. Did you have a chance to review my comments in Re: Re: Ask the Expert: EMC Captiva 7.1 Further Enhances Intelligent Enterprise Capture Capabilities? We understand your concern but if we need to patch older versions, we would only consider a filter string in command line. It is not possible to enhance scripting infrastructure as a patch. The filter expression follows Captiva expression rules. All variables come from the Batch list table non localized column names. In addition we support IALoginName. We would list the column names. There is no other context available. Batch list is shown to user before we get to any batch context. Until user picks a batch from the batch list grid, we cannot ask IA Server for a tasks. Any scripting at task level is not suitable for this requirement. Yes, it is possible to provide a global script function to filter and reorder the table but this requires many changes and is not a good fit for a patch. 1. The filter expression follows Captiva expression rules. -> OK, I can understand and accept this. 2. All variables come from the Batch list table non localized column names. In addition we support IALoginName. We would list the column names. There is no other context available. b) there might be problems with special characters within command line etc. 1. Introduce "CaptivaDesktopBatchFilterProfiles". These profiles can be defined and administered on Captiva server, using aptiva Administrator (similar to Departments). "CaptivaDesktopBatchFilterProfiles"would contain name and Captiva expression. 2. Introduce startup flag -batchFilter for Captiva Desktop, which will point to "CaptivaDesktopBatchFilterProfiles" name (again, just like Departments). Also please, give me the answer regarding Captiva Desktop behavior with -departments command line option (see my previous post for details...). I need to enable or disable text fields in the module eIndex based on the selection which the user of a list, example if you select the first option in the list, you must enable the text field " Name" , "Date" , if you select the second option in the list , you must enable other fields. plz help , how to design this flow?? Scanplus->Desktop for indexing-> Verification Step(Desktop)-> Export. Batch list need to be controlled. Let me know how to go about it, immediate support needed as we are left with few days. You can use eInput modules for that. It's possible to create private batch using eScan module. In that case only the batch owner (creator) receive the task to index the document. But requirement need to be implemented on Scanplus->Desktop module not between escan->eIndex. Appreciate if you can guide on this.